Assassin’s Creed Syndicate will be the name of the next installment in the Assassin’s Creed franchise. The title will be released on October 23rd on PlayStation 4 and Xbox One, with the PC version following at a later date. The title is set in London during the industrial revolution and will feature both a male and female playable characters. The title will be faster paced than previous entries in the series. Large scale gang wars will also feature in the title, where members of your gang will take on another for control. In a series first you will be able to drive trains and horse drawn carriages. You will also have access to a grappling hook, this will increase the pace of traversal. There will also be a dedicated button to switch between normal movement and stealth mode. Visually the game looks on par with Unity, hopefully with a more stable framerate. Though the game is not shown running on a console, we will have to wait for hands on impressions to be sure. It doesn’t sound like the game will have a dedicated multiplayer this time around, this is disappointing as the co-op missions in Unity and the PVP multiplayer in previous titles were quite fun & interesting. If however, the lack of multiplayer means more time is spent polishing the game so it doesn’t end up like Unity, then I’m all for it. 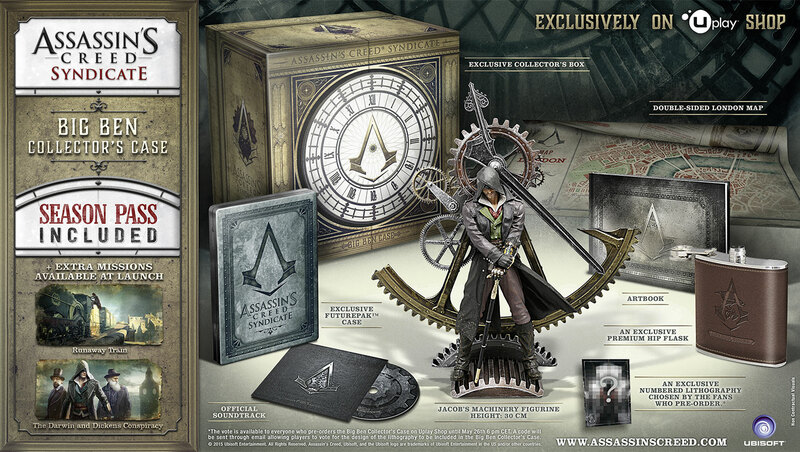 Ubisoft also announced a bonus mission if you pre-order the game now, along with this they revealed several collector’s versions of the title. These premium editions of the title mention a Season Pass which has not been detailed as of yet. The exclusive and prestigious Assassin’s Creed Syndicate Big Ben Collector’s Case is the definitive collection for the ultimate fan. This premium case includes an exclusive collector’s box, the Jacob’s Machinery Figurine, an art book, a double-sided London Map, the game soundtrack, a lithography chosen by the fans who pre-order, an exclusive FuturPak and an exclusive premium hip flask. At launch, you will get access to 2 single player missions for an extra hour of gameplay! In addition, the Season Pass will also be included so you will not miss any of the upcoming digital content. Explore Charing Cross Station – probably one of the most iconic stations of the Victorian’s era with The Assassin’s Creed Syndicate Charing Cross Edition. 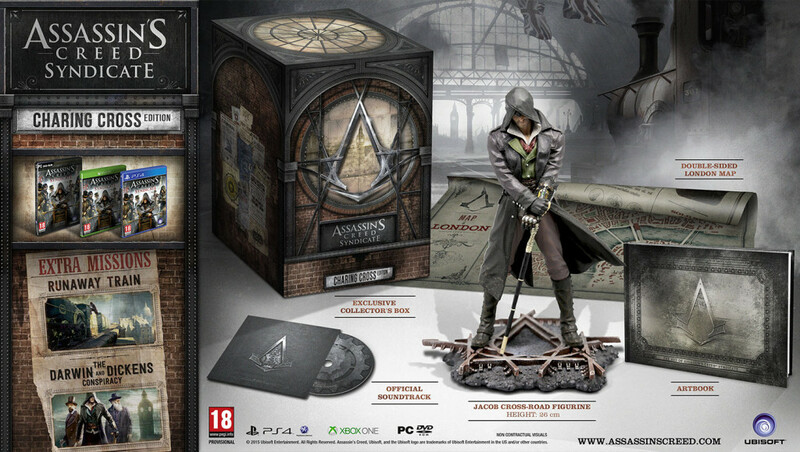 In addition to the game, this edition contains an exclusive collector’s box, the Jacob Cross-Road Figurine, an art book, a double-sided London Map and the game soundtrack. You will also get access to 2 single player missions for an extra hour of gameplay! The Assassin’s Creed Syndicate Rooks Edition, named after Jacob’s gang, is a testimony of the outlaw’s life shaped by robberies and murder. 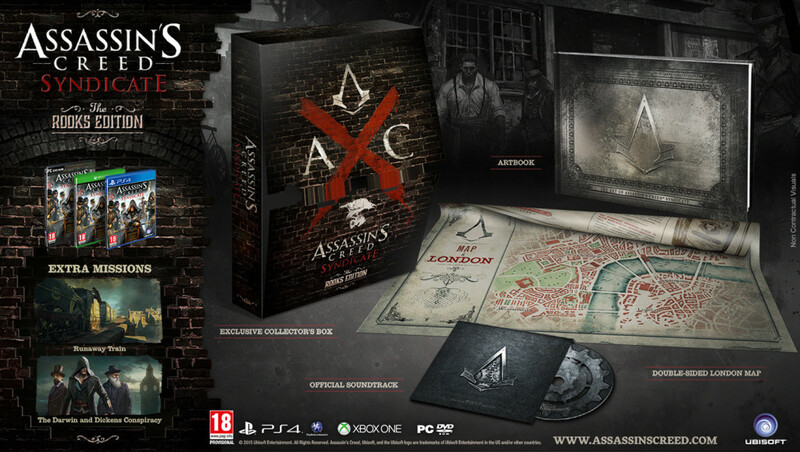 In addition to the game, this edition contains a collector’s box, an art book, a double sided London Map and the game soundtrack. You will also get access to 2 single player missions for an extra hour of gameplay! In addition to these variants a normal and Gold edition will be available, the Gold edition being the regular game with the Season Pass. Hopefully this game a marked improvement over Unity and a return to form for the franchise. Ranting About Games © 2019. All Rights Reserved.